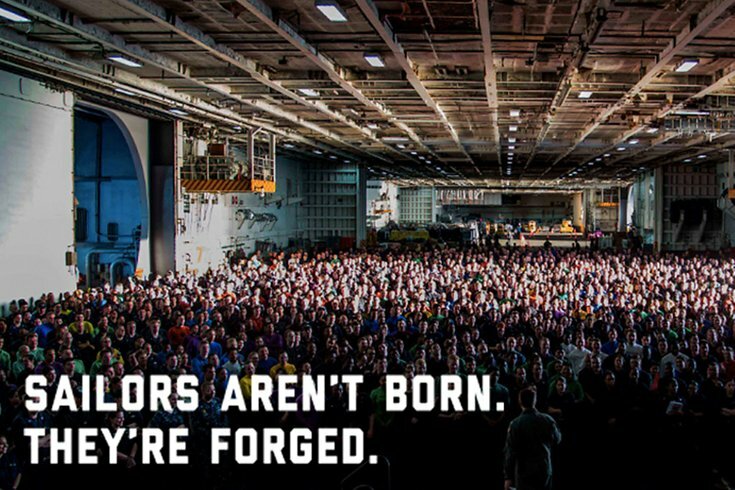 The U.S. Navy is launching a new tag line – ""Forged by the Sea" – as part of a branding campaign launched at future recruits. Just in time for this weekend's Army-Navy football game in Philadelphia, the U.S. Navy announced Tuesday it was launching a new tagline. "Forged by the Sea" will anchor a new branding initiative targeting a new generation of recruits. The official launch at Saturday's game is just the first wave of an integrated marketing campaign that will include digital and social media advertisement during the winter, before a full rollout in March, according to Rear Adm. Pete Garvin, commander of Navy Recruiting Command. The messaging will be in full force in and around the stadium on Saturday. The Navy Parachute Team, the Leap Frogs, will carry “Forged by the Sea” banners as they parachute into the game before kickoff. The “Forged by the Sea” tagline was unanimously selected by focus groups comprising the Centennial target audience as well as enlisted sailors, officers, Navy veterans, and key influencers. The tagline effectively communicates that the Navy has evolved in response to the sea, and that sailors are tested and shaped by the Navy/sea experience, becoming better versions of themselves, a news release said.